DOVER, NEW JERSEY, APRIL 12, 2018- Today, Casio G-SHOCK unveils the latest men’s limited edition digital watch collection in honor of the brand’s 35th anniversary. 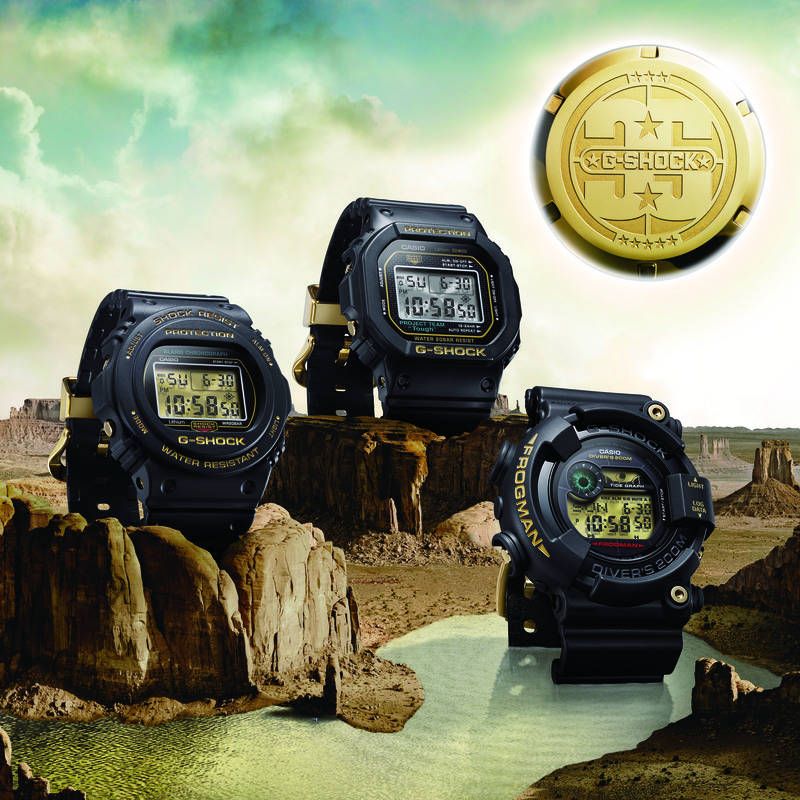 Paying tribute to the original G-SHOCK colorway of black and gold, the Original Color collection features three iconic G-SHOCK timepieces updated with commemorative gold accents, including DW5000 and DW5700 series models (DW5035D-1B, DW5735D-1B) and a FROGMAN (GF8235D-1B). Each model within the collection boasts timeless, vintage-inspired case design that nods to G-SHOCK’s longstanding brand heritage, as well as a gold buckle and a band loop engraved with stars to signify the 35th anniversary. The timepieces also feature the official G-SHOCK 35th anniversary logo, designed by artist Eric Haze, engraved on the case back. Incorporating the original stainless steel screw back case and brick pattern around the display, the DW5035D alludes to the very first G-SHOCK model, while the DW5735D is based on the DW5700 – an early G-SHOCK timepiece best known for its round case with a digital liquid crystal display. Designed specifically for divers with ISO 200M water resistance, the GF8235D model draws inspiration from the second generation FROGMAN and includes premium features such as self-charging capabilities, a full auto LED light, a tide and moon graph and 10 log data memory. Geared towards aviation professionals, the latest GRAVITYMASTER model boasts connected Bluetooth capabilities, tough solar technology, and G-SHOCK’s Multi-Band 6 Atomic Timekeeping technology, which provides accurate timekeeping virtually anywhere via radio signals from up to six different transmitters worldwide. Each model also comes equipped with legendary G-SHOCK technology of G-SHOCK technology of 200M water resistance and shock resistance, as well as an EL Backlight, multiple daily alarms, stopwatch and countdown timer and 12/24 hour formats. The DW5035D-1B, DW5735D-1B, and GF8235D-1B, with case sizes of 42.8mm, 45.4mm, and 50.3mm respectively, will retail for $200 and $500 and will be available for purchase beginning in May 2018 at standard G-SHOCK retailers, including Macy’s, shopcasio.com, and the G-SHOCK Soho Store.